A homemade chicken soup with a healthy yet rich broth. 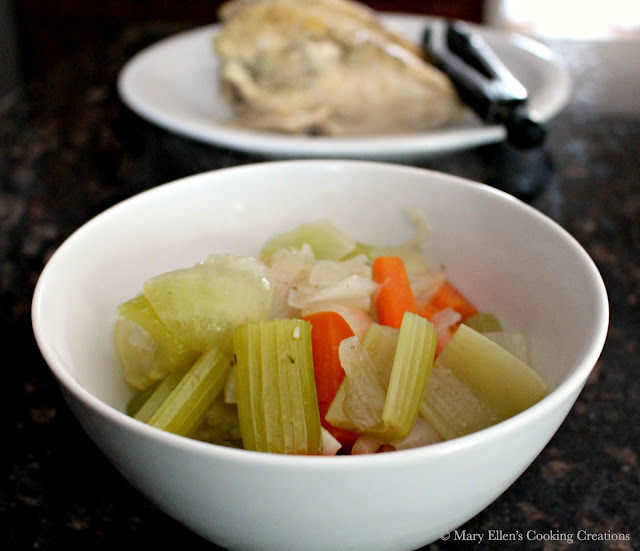 If you haven't made chicken soup from scratch before, you have to try it - it's so easy! And if you HAVE made it, you have to try my trick for the most amazing broth. Read on! Homemade chicken soup is the ultimate healthy comfort food. Just smelling it simmering away on the stove makes you feel warm and relaxed. 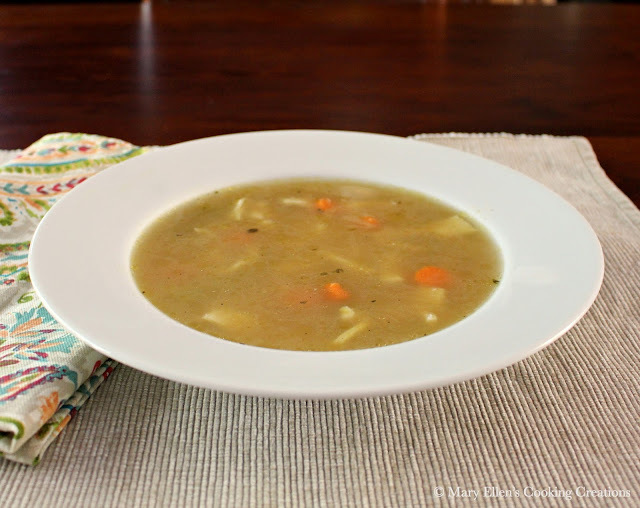 I love this soup so much that I have been making it every 2 weeks this fall and winter. There is nothing hard about making chicken soup from scratch. Its basically chicken, veggies and herbs simmered in water. First, browning the chicken and then deglazing the pan ensures that you get the most out of your chicken, and way more flavor than just simmering your chicken. Second, I puree the veggies once cooked and then add them back to the broth. This is still a broth based soup, but just a touch more thick and velvety from the pureed veggies. And just look at that color! 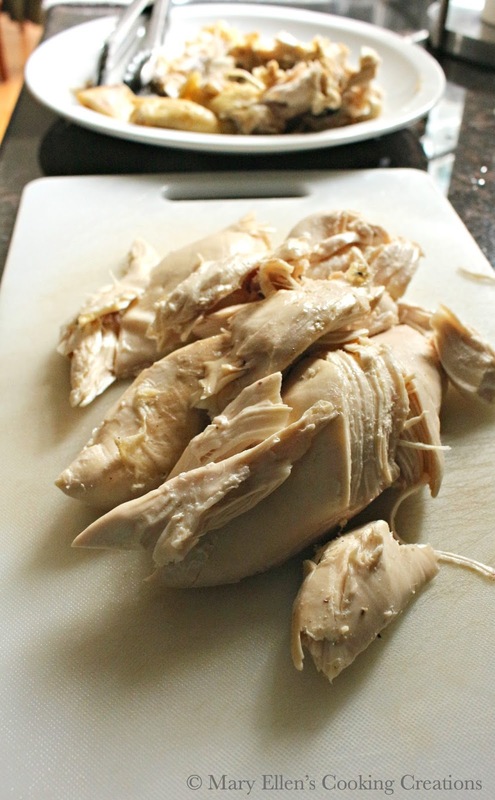 I use 2 split chicken breasts to make 6 servings of soup. Just 2 chicken breasts give you a lot of meat, so I'll often use 2/3 of it for serving in the soup, and then turn the rest into chicken salad for 2 lunches. So 8 servings of food from 2 chicken breasts that cost me $8? Can't beat that! One final tip - if you like to eat your soup with noodles, cook the separately. If you cook them in the broth they will soak up (waste) too much of your broth. I made homemade noodles for the first time to go with this soup. Only 2 ingredients and no pasta attachment needed, just a rolling pin! Check out the recipe for the noodles here! Season the chicken with the salt, pepper, thyme and poultry seasoning. Add the chicken to the pan and brown, approx 3-4 minutes per side. 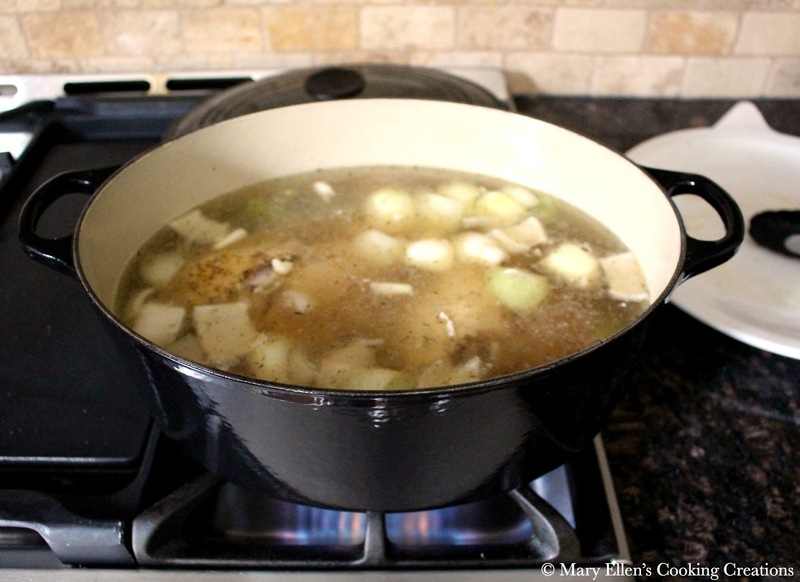 Transfer chicken to a large soup pot. Take 1/4 c of your water and add it to the saute pan over high heat to deglaze the pan, scraping up all of the brown bits. Once you have scraped everything up, pour this water over the chicken in the soup pot. Add your chopped veggies, the rest of the water and the bay leaf to the soup pot. Cover and bring to a simmer. Let simmer for 1 hour. Transfer the chicken to a plate; let cool and then pick all of the meat off. 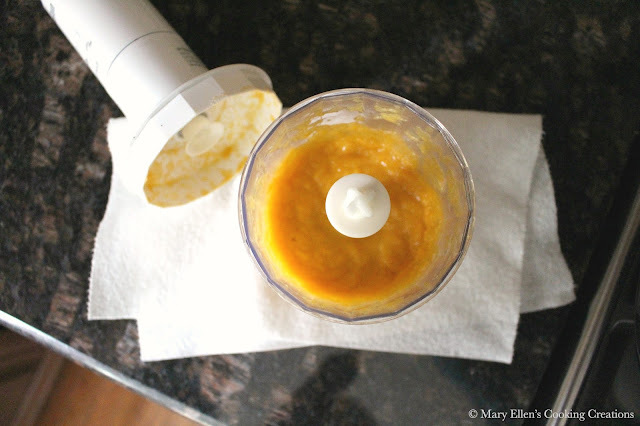 Using a slotted spoon, transfer all of the veggies to a blender or cup of a handheld stick blender. Puree until smooth, and then return the puree to the broth. Adjust salt and pepper if needed before serving. Serve with chopped chicken and (optional) noodles.